Girls' night and weekends at our house means hubby is fishing with the guys, and we have the kitchen to ourselves. So I tend to cook what monkey-girl prefers. Seafood is definitely one of the things on the list. We usually cook up some shrimp in some garlicky pasta, but I wanted to try something different for our last girls' weekend. 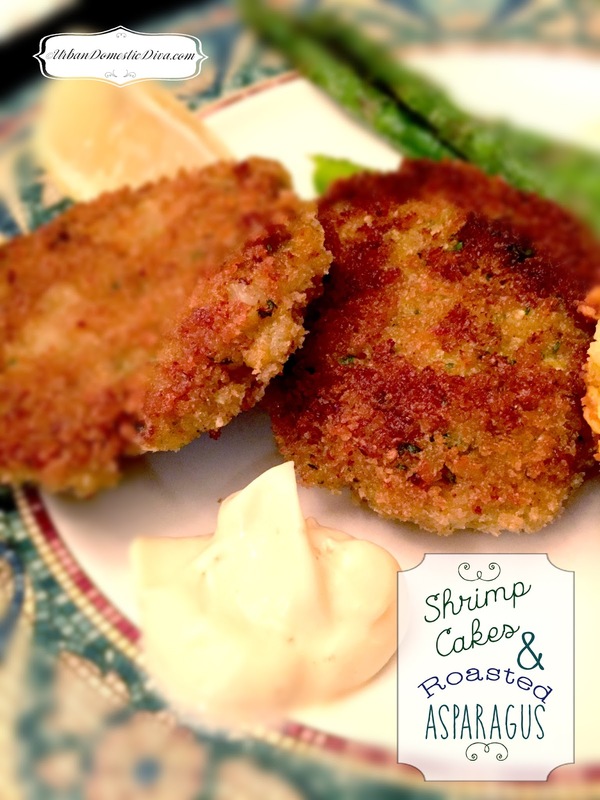 These are a fun twist on the typical crabcake, but using shrimp. This original recipe used a complicated spicy sauce to go with it, but I was short on time. So I made a simple Sriracha mayo to serve on the side, and it worked out perfectly. I am sure you can use different seafood or even a smoked salmon in these patties. Experiment with what your family may like! In a food processor pulse celery, onion and parsley until well minced. Add the shrimp, 1 cup of the breadcrumbs, the egg white, Sriracha, lemon juice, salt and pepper. Process briefly to combine. You only want a couple pulses or else you're going to really turn the shrimp into a paste, and you don't want that. Divide mixture into 1/4 cup portions, then form them into patties in your hands. Press them in the remaining 1 cup of Panko breadcrumbs so they have a crust on all sides. Turn the oven on to 375˚. Line a baking sheet with tinfoil. In a large saute pan, heat the olive oil until smoking, and add the patties to brown on all sides, about 4-5 minutes each side. Drain on a paper towel and then transfer them to the tinfoil lined baking sheet. Bake for the last 7 minutes of the asparagus cook time, until the patties are cooked through. Create a Sriracha mayo to serve with the shrimp. Just drizzle some of the hot sauce in the mayo until it's at the heat you like. Oven is at 375˚, same temp for the shrimp cakes above. Toss asparagus with olive oil, garlic powder, Kosher salt and black pepper on a foil-lined baking sheet. Roast in the oven, tossing once until crisp-tender for about 13 minutes. Halfway through the asparagus roast time, you are going to cook the shrimp cakes with the last half of the time so everything comes out together and the shrimp cakes are cooked through in the middle.